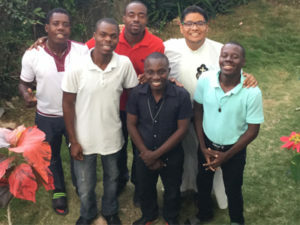 We Passionists, who are serving in Haiti, have great dreams for our ministry here. Our privilege as Religious has given us the opportunity to test our strengths and see where the possibilities will lead us. My initiative with the farm did not evolve as planned. I wanted to continue to grow chickens and goats but that was not possible. There is no water in our property and banana trees do not mature quickly. I planted about 100 of them in order to feed my goats. 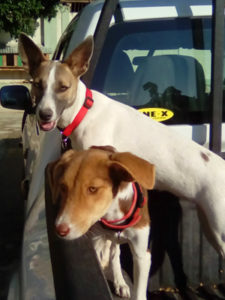 I donated my goats to families in need, and I even got a few dogs in exchange, Ik and Puy. However, Ti fem Daniel Francois continues to bear fruit. I have grown in the conviction that I will make mistakes and learn from them, but I will never fail. My miscalculation in water and food for our farm, Daniel Francois’ intersession and God’s Spirit, led me to enter into new and great friendships with a few families from our neighborhood. This has also led me to wonderful opportunities. After the earthquake in 2010, about 20 families settled in a piece of land no more than 200 yards long and about 20 yards wide that was to be a street. Some of the young men that started to work with me in the farm live there. After a few months of work and visits from their parents, they invited me to visit their home. I was welcomed with a hot pot of fresh cooked rice. We had the meal inside a 6 x 10 foot shack made of old plastic tarps, cardboard boxes and tree branches left over from the earth quake seven years ago. I was given the best seat of the house, a five gallon bucket that they use to collect water for the day. The needs are great in this little piece of land, a reflection of the whole country. Additionally, I continue my official position as Director of Students. We have five seminarians, and the grind of everyday life is humbling for me. They get to see me at my best and, from time to time, at my worst, especially when I am frustrated. They are my community for the time being, and I am blessed to have them in my life. 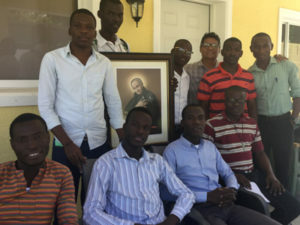 We have been also working with vocational prospects; there are 15 young men who are officially in our first stage of discernment, which is a year-long process. We meet every month for a day of recollection. There are nine young men who will soon be ready to apply for entrance into our preparatory year. This preparatory year is done in partnership with other religious communities. It will give them tools to grow into community life, human growth and the intellectual demands that university/ philosophy will put on them. We are busy! As much as I can, however, I take breaks, breathe easy, play with my dogs and remind myself that God is in control. Error: Error validating access token: Session has expired on Monday, 18-Mar-19 14:16:37 PDT. The current time is Thursday, 18-Apr-19 20:13:54 PDT.